Each person is unique, so the many lens options we provide allow us to best recommend glasses that fit your everyday needs and protect your eye health. The followng list is not a comprehensive list of all the options we offer. For more information on lens coatings feel free to give us a call or stop by our office. As your prescription increases so does the thickness of the lens. This can cause your glasses to feel heavier, increase peripheral distortion, and create minification or magnification of your eyes. In order to reduce these effects, there are thinner lens options including: Polycarbonate, High-Index, and Aspheric. Polycarbonate: This lens comes with UV protection and impact-resistance. High-Index: A very thin and very light lens that has built in UV protection, the high-index lens is best suited for higher prescriptions. Aspheric: An aspheric lens will make the edges and center of the lens more equal in thickness (although not perfectly) in order to reduce the cosmetic change of the eyes as higher prescriptions will cause the eyes to look smaller or larger. 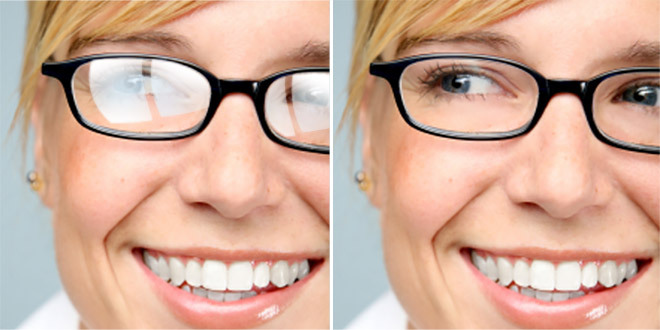 A lens coating that will decrease the reflection from your glasses. The anti-reflective coating is recommended for patients who drive often at night, watch television, or frequently use the computer. It also gives glasses a cleaner look and is good for patients whose jobs require interacting with people as you will be able to see the eyes clearly. ​The premium coatings come with a 1 year warranty. This lens will protect your eyes from ultra-violet (UV) rays that could damage your eyes and contribute to cataract. Will prevent lenses from scratching as easily. Premium coatings come with a 1 year warranty. This coating will reduce the glare off of roads and car windows making driving more comfortable. It is preferable for fishermen because it takes off some of the glare from the water on the ocean. Not a polarized coating, tints add a color to your lens. Most common colors are gray, brown, and amber; however, tints can come in a wide range of colors from blue to red. With this option, your lens will darken when exposed to UV light, but they are not polarized and will not darken in the car because the windshield and roof of the car blocks out the light. Makes the typically white, opaque edges of the lens clear to give it a cleaner look. This is recommended for higher prescriptions and semi-rimless or rimless glasses. Now that you know about the many lens options, how do you know what's right for you?